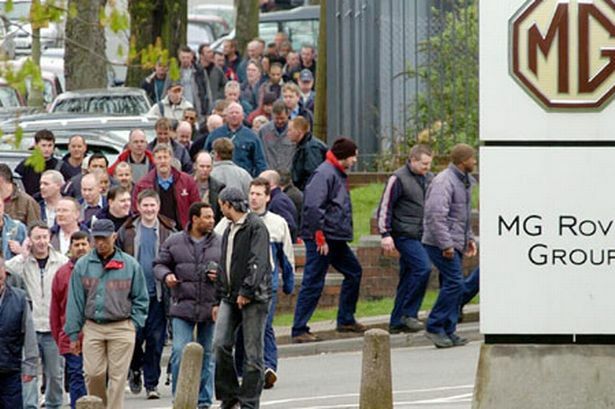 About 6,500 former MG Rover workers at Longbridge are in line for just £3 each after a seven-year wait for compensation. The derisory sum – minus the cost of postage - was revealed by angry Trust Fund organisers after a meeting with Phoenix Venture Holdings following the High Court’s rejection of a claim against banking giant HBOS. The bank had withdrawn £12.5 million earmarked for the fund, claiming it was owed the money following the collapse of the car firm in 2005. Now after the High Court rejected moves to divert the cash back to workers, trustees have abandoned all hope of payouts of around £2,500 for former workers. Instead the ex-employees could share just £22,000 – around £3 per person, minus postage costs – unless the Phoenix Four make personal donations. Trustee Carl Chinn said: “We have been told that all legal avenues to retrieve the fund have now been exhausted – there is no way we can go any further with this. “The Trust Fund has just over £22,000 which if it were to be distributed to 6,500 people would be around £3 each. ‘‘We have therefore made one last call to the Phoenix Four and former chief executive Kevin Howe to make a significant donation to the Trust so that we can send out something larger than £3. Fellow trustee and former Unite official Eric McDonald said: “This is news we didn’t want to hear. Former Longbridge employee Oliver Thomas, of the Justice for Rover Workers group, said: “This is a sad moment where our hopes of cash being transferred into the Trust Fund rely on yet another plea to the ex-owners. ‘‘They will tell you that they kept MG Rover running for five years, and did their best. A May 2010 statement from the Lloyds Banking Group, parent group of HBOS, defended the decision to keep the £12.5 million, raised from the sale of Studley Castle conference centre and some dealerships. It said: “As a major lender to MG Rover we have made losses from its collapse. ‘‘We therefore have a duty to our shareholders, including the taxpayer, to try to minimise these losses. Along with other creditors, we are seeking to do this through the normal recoveries process. “We are very mindful of the hardship that MG Rover workers suffered. We have made substantial donations to the West Midlands community and we are playing our part in supporting the region’s economic recovery. MG Rover collapsed in April 2005 with debts of more than £1 billion, throwing 6,500 people out of work after nearly five years under the Phoenix regime. Former chairman John Towers had initially estimated the value of Phoenix Venture Holdings assets for potential transfer to the Trust Fund as between £10 million and £30 million.